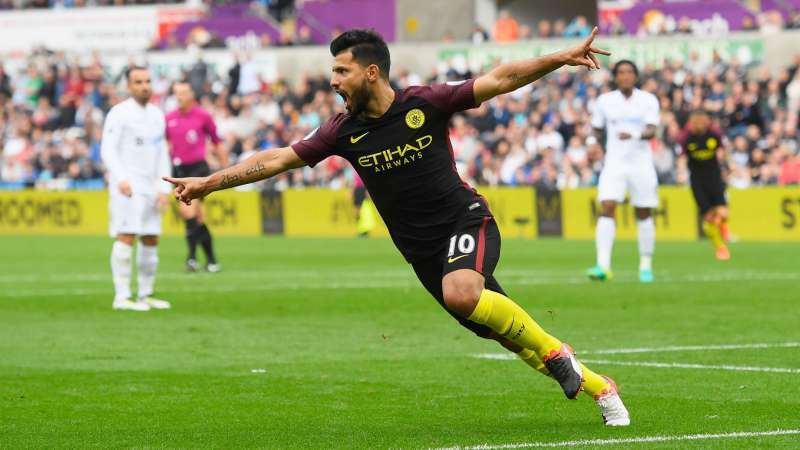 Manchester City won a hard-fought 3-1 victory against Swansea at the Liberty Stadium. Sergio Aguero opened the scoring with a fine goal, the scores were leveled by Fernando Llorente’s beautifully taken goal. City improved in the second half and sealed the win with a penalty from Aguero and a solo goal by Raheem Sterling. With that win, City have now won their first 10 games under Guardiola and stay at the top of the EPL table. Let’s take a look at the player ratings. The Polish goalkeeper could have done better for Aguero’s first goal but was not at fault for the remaining two goals. In fact, he did well to keep Swansea in the game with a good save from Fernandinho in the second half and showed alertness to tip Silva’s deflected shot over the crossbar. The Swans right-back did not have the best of games as Sterling and Silva pegged him back from going forward and he struggled to cope with their skill and movement. Amat started the game slowly but gradually put on a good defensive performance especially in the first half as City failed to get a hold onto the game. He stayed tight on Aguero, preventing the City marksman to take a shot and made a crunching tackle on him to prevent a goal in the second half. The Dutchman played a solid game at centre-half winning the physical battle and gave a steady defensive performance in the Swans defence. However, he let himself down by conceding the crucial penalty with a flailing arm on de Bruyne. The left-back had a good game by managing to keep de Bruyne quiet in the first half. He also supported the Swans attack which included a fine pass for Llorente in the first half and another cross that the striker headed wide. In the second half, he defended well as City came into the game and performed a strong tackle on Aguero and a good block on Sterling to prevent them from scoring. Leon Britton put on a typical industrious display in midfield and did well in dictating play in the first half. He was however overrun in the second half and was replaced by Sung-Yong Ki. The Englishman was full of running as Swansea dominated the game after equalizing. He, however, failed to make any notable contribution in an attacking sense and faded as the match grew on. The Dutchman was the first to press and harry the City midfield in the first half and matched up to his no. 8 counterpart Gundogan for a period. He won free-kicks, made good runs and ball recoveries in the first half but got outclassed by City in the second half. 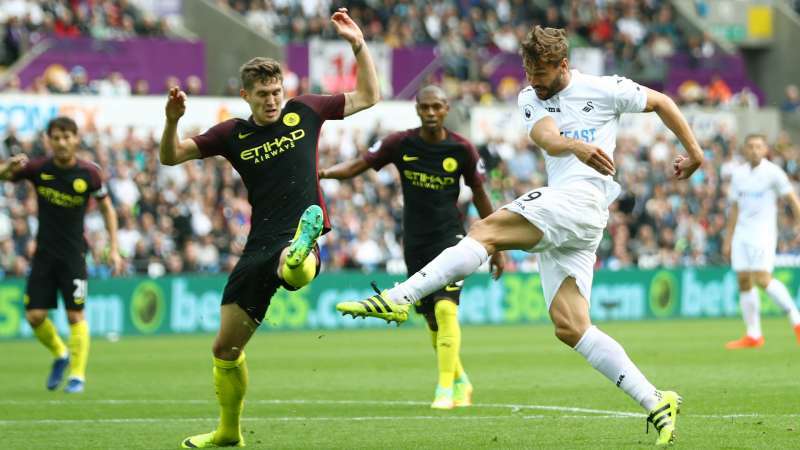 The Iceland international did well to set up Swansea’s goal after being responsible for City’s opening goal by not tracking Sagna. He tried to make things happen for the Swans but to not much avail. He should have scored from Routledge’s looping cross in the second half. The wideman posed tough questions to Kolarov as his pace left the City left-back exposed at times and picked fouls off him. Routledge put in a few good crossed including a good one to Sigurdsson in the second half who failed to score. He picked up a yellow for a strong foul on Stones and was replaced by Barrow. The Spaniard had a fine game leading the line for Swansea. He made good use of his physicality to cause problems for the City defence and scored a fantastic goal to get the Swans level in the first half. Prior to that, he extracted a good save from Bravo. Overall, he did well against a top defence although he could have been better with his heading. Barrow was introduced with Swans chasing the game and made one good run late into the second half. The South Korean came on for Britton and did little to impact the game. Baston was introduced with 10 minutes left and did not have enough time to change the game.